Yarn is the original magazine published by what became ArtWear Publications. Yarn is published in March, June, September and December each year. 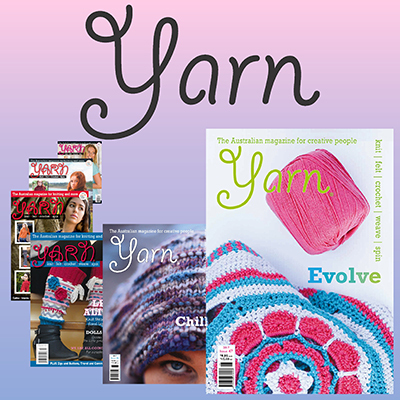 Yarn has undergone a number of editors since that first issue, and we are filling Yarn with many different techniques for playing with yarns and fibres, as well as instructional, inspirational and just plain fun articles. Yarn is published in March, June, September and December each year. Your subscription will begin with the NEXT issue to be published. If you wish to start with the current issue, place your subscription order and then contact us via the contact form (here) or email thegirls (at) artwearpublications (dot) com (dot) au to request the different start issue. You will love delving into the world of yarns and fibres with this magazine as inspiration!